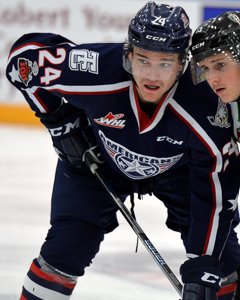 REGINA - The Regina Pats Hockey Club has announced they have acquired 20-year-old forward Brett Clayton and a third-round pick in 2019 from the Tri-City Americans in exchange for 20-year-old defenceman Aaron Hyman. Clayton (6’4, 220), has played 163 games in the Western Hockey League between the Portland Winterhawks and Tri-City Americans. The product of Abbotsford, B.C. has nine goals and 21 assists in his WHL career. Hyman (6’5, 221), was acquired by the Pats in January of 2018. The 20-year-old is enjoying a career year with five goals and 24 points in 25 games this season. With the move, the Pats sit with 24 players on their roster, 15 forwards, seven defencemen and two goalies.